EDITOR’S NOTE: This is the second of a three-part series on pressure pipe presented by the NASSCO Pressure Pipe Committee. There will be an in-depth program track on these topics and more at UCT, Jan. 29-31, 2019, in Fort Worth, Texas. Every water main rehabilitation project utilizing a coating or lining begins with pipe cleaning. While cleaning can be loosely defined as the removal of all solids (corrosion, sediment, tuberculation, deposits, scale, linings, biofilm and foreign materials) from the interior pipe surface, the overall process must also consider the additional needs of surface preparation for the rehabilitation product. A clean surface that is not properly prepared (e.g. profiled, dried) can adversely affect integrity and performance of coatings and certain lining systems. Regardless of the degree of rehabiliation, a properly cleaned and prepared pipe surface is necessary to deliver long-term performance. When discussing surface preparation, it’s important to realize that different products yield different requirements used to define “proper” preparation. Specific recommendations from a rehabilitation product’s manufacturer should be researched to provide correct guidelines when writing project specifications. Table 1 summarizes the four principle types of water main rehabilitation products covered in this article and offer a corresponding general performance standard for cleaning and surface preparation. Cleaning specifications in water main lining contracts will frequently outline a performance standard or desired outcome and may list candidate cleaning methods. However, technical specifications seldom mandate a specific cleaning method be used. The onus for choosing the most-efficient tools to attain proper preparation for the lining product generally rests on the contractor performing the services and reliance on the product manufacturer’s recommendations. Cost is always a big issue. Unfortunately, most owners believe cleaning is incidental to lining. Cleaning/preparation methods are often dictated by availability, cost, time and resources (equipment and labor) required, versus the best method to prepare the pipe surfaces to receive the rehabilitation product. The outcome of pipe cleaning is mostly commonly assessed using pre-lining CCTV. It is of paramount importance that pre-lining video inspections be completed, reviewed by the owner or a representative, and approved prior to the execution of lining operations. In the absence of such a review, protrusions, wet pipe, old linings, and residual corrosion and sediment can all end up being incorporated into lining operations. Post-lining rectification then becomes a real challenge for both the owner and contractor. Pipe cleaning methods are described in Table 2, together with expected results. AWWA Manual 28, Rehabilitation of Water Mains, provides additional details and descriptions of the various cleaning methods. Commonly, these methods are separated into two categories: those driven by water or air pressure, and mechanical. 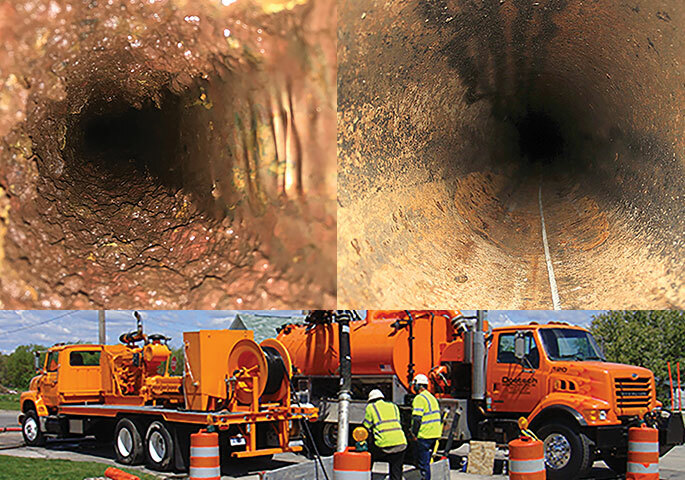 Although flushing is used to provide basic cleaning to water mains, high-pressure water jetting is utilized to remove loose debris and contaminants. Pigging includes the use of foam pigs, ice pigs or polyurethane coated pigs (with or without captive abrasives) to remove sediment and surface deposits. Pigs may be powered by water pressure or mechanically towed to accomplish their task. While they are effective for the removal of sediment, they are less effective for the removal of tuberculation, deposits and protrusions. They are frequently used to perform routine or light cleaning, and as a secondary method after mechanical cleaning to remove accumulated water. Air-driven stone is a patented technology utilizing high-volume, low-pressure air to propel stone through the pipe, effectively scraping the interior walls to clean, prepare and dry the surfaces to receive a coating or lining. Mechanical cleaning methods, including chain scraping or reaming, drag scraping and power-boring, are used to remove very hard deposits and encrustations. Each method has its relative benefits and limitations depending on comparison parameters. Multiple methods are often employed to achieve the desired results, for example drag scraping followed by jetting and swabbing. The problems associated with improperly cleaned pipe can range from negative impacts on the rehabilitation process itself, to pipe damage (holes created, services damaged or plugged) and even premature failure of the rehabilitated pipe. Such failures include protrusions and corrosion left behind, negative impacts on adhesion, leakage at unsealed liner terminations and service connections that can subsequently follow or “track” within annular space between a liner and the host pipe. Precautions must be taken when using all methods in a pipe cleaning toolbox. Damage to a deteriorated pipe and services can be exacerbated with high-pressure water jetting, drag scraping, or the impact of rotating steel flail arms on a rack feed boring machine. Service connections can be damaged from all mechanical cleaning methods, including excessive use of large-caliber stone when using air drive stone cleaning. There is ongoing research and debate within the industry related to adhesion of these rehabilitation products and direct correlation to host pipe cleaning and preparation. As this pertains to Class I, cement mortar linings provide a corrosion barrier with no reliance on bond to the host pipe. However, adherence or bond of Class II interactive systems to the host pipe interior is a fundamental design requirement. Further consideration should be given during design to product thickness, material strengths and the surface preparation requirements to attain adhesion that will allow the lining to survive vacuum loads and/or dewatering, and avoid lining delamination and failure. Venturing into Class II and III, applied polymer linings require adhesion as previously mentioned. Determining adhesion requirements with cured-in-place pipe (CIPP) linings, however, is a more complex discussion. On some CIPP lining applications, adhesion may be desirable to maintain water tightness or hydrostatic integrity, such as at liner terminations where mechanical seals are not employed, or at robotically reinstated services to prevent water migration/leakage traveling between the lining and host pipe. In other CIPP applications, adhesion may not be desirable, such as in pipelines that experience broad temperature swings where thermal stresses can result in cracking or collapse of the lining. Although the myriad methods to clean and prepare pipe have remained principally the same over the past decade, improvements have resulted in greater efficiencies (e.g. less time and cost) and may optimize preparation with profiled and dry surfaces when adhesion is required or desired. Because aging water infrastructure, coupled with urban development and congestion of buried utilities, is expected to increase the use of coatings and linings for trenchless rehabilitation, the acceptance of these products for water main rehabilitation is also expected to improve. In summary, we believe that the successes and failures experienced by using water main rehabilitation products is expanding industry knowledge and understanding of the need to prepare host pipes in ways that enable more of these products to perform long-term.